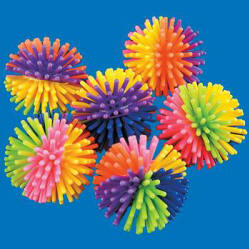 1 1/4” Vinyl Multi-Colored Porcupine Balls (32mm). (Make certain your parrot does NOT actually consume these!) Our parrots love to pull the "legs" off these toys ... and this triton cockatoo (Neptune) agrees ... what fun!